I had my rant about how we should not let the busybodies and Church Ladies of the world ban everything that carries some statistical amount of danger. Now it's all academic: the smoking ban is here. Let's look at the upside. As a non-smoker, there are a lot of pubs and bars that suddenly seem more inviting to me. Topping the list, of course, is the Horse Brass. When Carla and I were on our way over there January 2 to enjoy its smoke-free splendor -- by the way, it was packed that night -- I was shocked to hear my own dear wife say that it would be her first visit to the Horse Brass. She's all for the smoking ban. 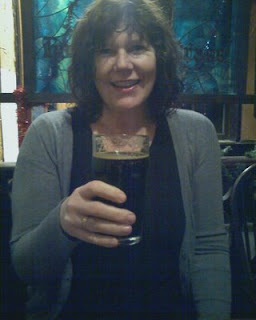 I think she might be a Church Lady: look, she even drinks her Caldera Smoker's Stout in front of the Brass' stained glass. Claudia's has a completely respectable beer selection for a sports bar. I've never been inside the Hideaway, but it's three blocks from my house. The other places on the list have bona fide cool, but the smoke was annoying enough to keep me away. There are some nearby dives that I'll probably check out -- like Ladd's Inn, Reel'M'Inn, The Slammer -- although the beer selection may not be up to my snobbery. I'm not really a strip-club guy, but I could imagine a visit to Mary's Club now that there's no smoking. So I ask you, Dear Reader: What are some other good places in Portland that are now worth it for a non-smoker to go to? I would be absolutely shocked if the Horse Brass continues to see more business as a result of the ban throughout the year. Unfortunately, the only bars the ban will help are the ones on the Washington side of the river as people will commute to bars that allow them to smoke. (I'm a non-smoker - but feel terrible for the local pubs that are going to lose business because of the ban). On December 8, 2005, Washington became the 5th state to implement a comprehensive statewide law prohibiting smoking in all indoor public places and workplaces including restaurants, bars, taverns, bowling alleys, skating rinks, and non-tribal casinos. That is a ridiculous argument. You're saying that people that won't smoke, will commute to WA so they can have a drink and a smoke indoors? Please name what local pubs you anticipate losing business to WA? As seen in Chicago with it's smoking ban, a mass exodus to the suburbs to restaurants/bars never occured because of the smoking ban. Your statement was used extensively, but so far nothing of the sort has happened. TOTALLY with you on Claudia's. I loves me some Badger action, and I generally have to go there to see them. The cognitive dissonance of watching a game through a dense cumulous cloud of Virginia's finest was always a little hard to bear. As for business effects, I think it's pretty well-established that other states haven't seen a decline. It will kill Don Younger to learn this, and the younger, healthier, non-smoking crowd won't necessarily be the crowd he wanted to attract, but his business will probably improve. Maybe this is the one area where Church Ladies and progressives/lefties/whatevers intersect--- banning indoor smoking in public spaces. I'm surprised Portland didn't ban it in 1979, only because Austin just made it a major public "no no" a few years ago. Or maybe I just still have stars in my eyes. I went to Claudia's on Sunday, just for a little while to get out of the house for a while. It's a short walk from home. Seven hours (and rather a lot of number of dollars) later, I left. I'm going to have to watch myself. I used to time my leaving to the point where I just couldn't stand the smoke anymore, but now I'm going to have to convince myself to leave after the game's over. Here in Chicago, many small neighborhood bars ignore the ban with NO complaints from workers, customers, or neighbors. The only complaints are from neighbors of bars that comply. Po: I consider myself progressive also. No problem banning smoking in public. Yes problem banning it in a place where no kids are allowed, that people can choose not to go to, where non-smoking alternatives already exist. It's really a matter of minding your own business. Of course we need rules and regulations to keep society in order. But if you want to restrict someone else's behavior for your own convenience, you're not being progressive, you're being a busybody. Everybody is going to complain about something...I'm glad to not have reason to complain about leaving the bar with a sinus infection and smelling like an ashtray. Wow! Claudia's is getting some love. Now, Jeff and Mary Sue, what other places are more interesting after the ban. Thanks for getting it back on track, Dave! That's a great tip, I've never even heard of Rose and Thistle. It's not even in the Good Beer Guide. Bill: Rose and Thistle doesn't have the greatest selection of beer in town, but certainly qualifies under the "too smoky to consider before the ban" catagory. I'd also like to add Stanich's; again, not the greatest beer selection, but one of my favorite dive bars. The smaller music venues are also much more attractive now: Dante's, Ash Street Saloon, etc. RIDE WITH ZEKE! Joseph: another good tip! How's the beer selection at the space room? There's a bunch of dives up that way I'm tempted to check out: Mulligans and Sewickly on Hawthorne; on Belmont there's the Triple Nickel, Belmont Inn, and of course The Vern. Anyone have opinions on those?